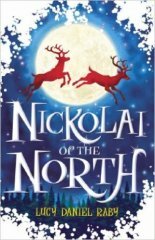 Nickolai is the last elf in the world, rescued from the destruction of his kingdom by Comet, a flying reindeer. Growing up amongst humans, his Quest for identity becomes his destiny to save the world and create his Christmas mission, in this thrilling story of how Santa came to be. Lucy Daniel Raby is an award winning writer with a long background in children's TV, including BAFTA winning shows Shaun the Sheep and Angelina Ballerina. She also created her own successful show, Big Kids, for CBBC. The Nickolai books are under option to Gatehouse Productions and currently in film development.